On Thursday 7 June, eu.esco, EFIEES, EU‐ASE, Factor 4 and EVO organised, in the framework of the EU Sustainable Energy Week 2018, a seminar on “Energy Performance Contracts to foster Energy Efficiency in the public sector – how to turn difficulties into success?”. The successful event took place in a packed “Lord Jenkins Room” at Charlemagne building in Brussels and was attended by participants representing European institutions, relevant sector associations, consultancies and academics. 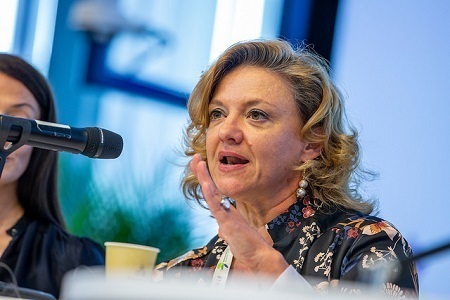 Ms. Monica Frassoni, President of EU‐ASE, opened the event introducing the broad realm of possibilities they offer in the field of energy efficiency, contrary to the opinion they usually arise. “EPCs are a fantastic tool to address one of the main barriers to implement energy efficiency projects, which is the financial barrier and the idea that energy efficiency is costly”, Ms. Frassoni reminded the attendees, “and one of the most important objectives of this event is to find out how we can actually take away the existing barriers so these instruments can be more effective”, she added. The first panel, moderated by Ms. Frassoni, was kicked‐off by Mr. Oliver Rapf, Executive Director of BPIE, on “The public building stock: what is the current status and what the main barriers to energy efficiency improvements?”. Mr. Rapf reminded the exemplary role that government’s buildings have to play regarding buildings’ energy renovation according to EED Art. 5 and proved the impressive untapped potential for energy savings by showing the distribution of the EU building stock’s consumption according to the EPC rating in 15 countries, with the major part of the building stock only labelled D or worst. Concluding his intervention, Mr. Rapf underlined that stronger actions are needed in the coming years concerning the renovation of public buildings, with a major role that must be played by long‐term renovation strategies that will prove successful if designed to provide appropriate signals to the market. Immediately afterwards, Ms. Theresa Griffin, S&D MEP member of the ITRE committee and EU Energy Week Ambassador, highlighted the importance of energy efficiency, keeping in mind that the best energy source is the energy that is never used in the first place. She also stressed the importance of fighting against energy poverty and reducing pollution, without giving up on growth: on the contrary, energy efficiency creates jobs and growth, while at the same time reducing pollution and preserving health. The second panel, led by moderator Mr. Volker Dragon, Chair of eu.esco, was opened by a presentation of Mr. Joan Vidal, European Energy Solution Development Leader at Honeywell Building Solution, illustrating the basic concepts of the EPC model and showing some impressive numbers on the potential of EPCs in the EU Public Sector: carbon footprint reduction up to 14M tCO2/y, energy cost savings up to 4,600 M€/y and an impact on jobs and economic growth up to 5,500 M€/y. After Mr. Vidal, it was the turn of Ms. Kamila Waciega, Director for Energy in the Public Affairs Department of VEOLIA. Ms. Waciega centred her presentation on an EPC project that was carried out in the Fragonard High School in the Paris’ region, under a new contract type called “global contract” that covers design, implementation, operation and maintenance. The benefits achieved by this projectshowed how EPC can be hugely beneficial for deep renovation projects: 45% reduction of gas consumption, 30% reduction of electricity consumption and reduction of primary energy consumption from 190 to 60 kWhep*/m2/year. Mr. Javier Siguenza, Secretary General of AMI, started his presentation welcoming the new Eurostat Accounting Rules and Practicioners’ Guide, but also voicing some reservations on some elements, such as the fact that operational payments in the EPC would have to be less than the energy savings, such a rule – he claimed – would make the renovation of buildings almost impossible. Also, other elements of concerns would be the lack of payments before the end of construction – with a consequent long period without cashflows – and the fact that the maintenance saving would not be considered in the calculation of Energy Services. Mr. Robert Pernetta, Financial Instrument Advisor at the European Investment Bank, revealed the new Eurostat Guidance Note, that, together with the new Practitioners’ Guide, is opening the way for “off‐ balance sheet” EPC. Mr. Pernetta explained the scope of the guide (minimum contract length 8 years, Energy Performance Contracting financed by private EPC provider, Energy efficiency related assets, including renewable energy) and the most important principles of the new payment mechanism: principle of proportionality (% payment relates to % savings achieved), no cap on EPC provider’s liability for savings shortfalls and the fact that the authority cannot take more than 1/3 share of the savings excesses. Concluding the second panel, Mr. Geert Goorden, Project Manager at Factor 4 and Mr. Pierre Langlois, Chair of the Board of EVO, co‐presented the “QualitEE” project, with particular focus on Measurement and Verification (M&V). QualitEE aims at driving investment in Energy Efficiency Services by providing Quality Assurance. Within the QualitEE‐project, Technical as well as Financial Quality Criteria are being developed in order to standardize the assessment of energy efficiency services, which is expected to bring trust in the energy efficiency arena. With respect to M&V a new initiative was announced: EVO’s new Certified Energy Savings Verifier (CESV) training and certification program. After an interesting and fruitful Q&A session, mostly concentrated on the new Eurostat Guidance Note, the event was wrapped up with the final remarks by Mr. Bernard Thomas, President of EFIEES. He stressed the role of Energy Efficiency Services in general and of EPCs in particular towards the achievement of our energy efficiency and decarbonization goals, calling, for instance, for their full inclusion in the Long‐Term Renovation Strategies that MS will have to design according to the new EPBD. He reminded that the right combination of measures is key to deliver the necessary energy efficiency improvements and that there is no one‐size fits all solution. A case‐by‐case approach is therefore needed and energy efficiency services are the best answer to situations and needsthat can vary considerably from time to time. Photos of the event available here.